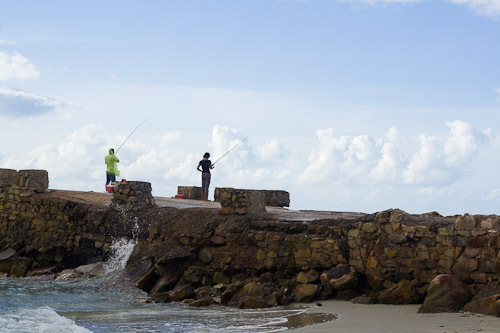 Vuon Quoc Gai Ba Vi, North Vietnam. I bought a motor-bike in Hanoi, a Honda Win. 100cc of pure power. Oh actually it might even be 110cc. I was really freaking out about driving out of Hanoi but it was not that bad at all. I started off at 5am and just followed my map and I was out of there relatively easily. The funny part was that I got lost out in the country side. I went to the wrong resort because people were telling me it was Ba Vi but it wasn’t. Eventually I got some correct directions and found the national park. I went for a walk after I found a room in a hideously expensive guest house – $20. 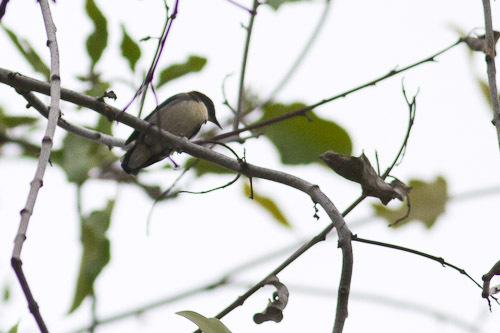 Ran into some more Sooty-headed Bulbuls. They are everywhere I go. 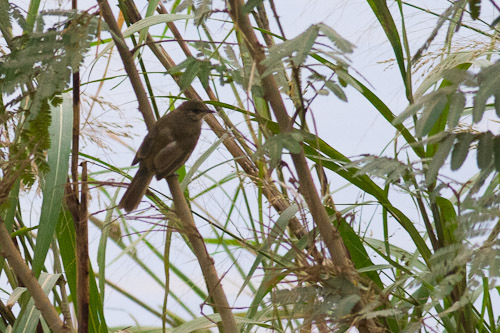 Well, some kind of bulbul is. It was pretty dark in the afternoon so I had to use flash on some of these shots. 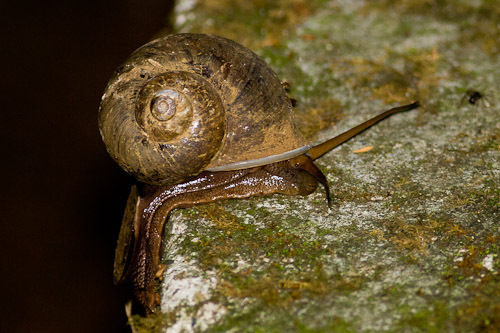 This snail was crawling out of the jungle. Check out his smile. He looks a lot like Gary, Spongebob Squarepant’s pet. 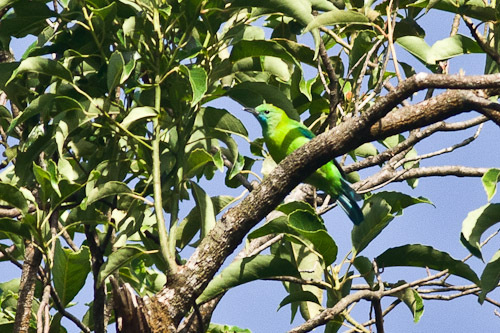 I also saw a couple of Red-crowned Barbet (Megalaima rafflesii), but the photos are crap. There were a bunch of Grey Treepie who were hanging out with a few Red-billed Blue-magpie (Urocissa erythrorhyncha) amongst the pine trees. It was so dark. arghhh. And another day is over. The next morning I rode the bike up the mountain and stopped at some places along the road where there was a bit of light getting in. There were quite a few birds around but it was really difficult to photograph them because there were clouds coming in and blanketing the whole area in fog. 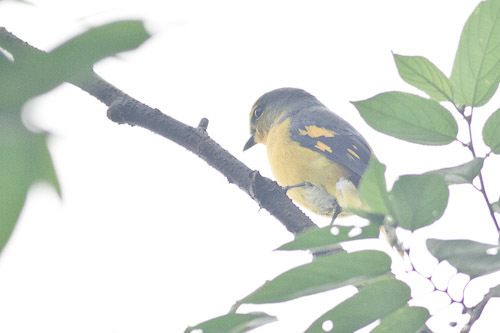 This is the female Scarlet Minivet. 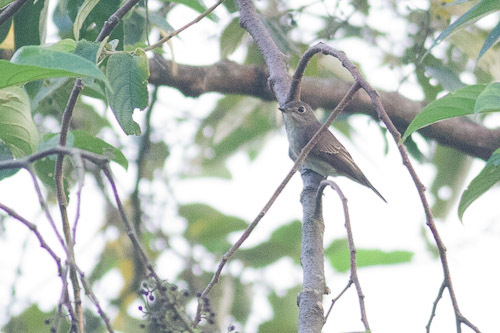 After my morning birding I packed my bags and headed up the road, through some mountains, villages and dirt roads to Hoa Binh, which is south of Ba Vi. 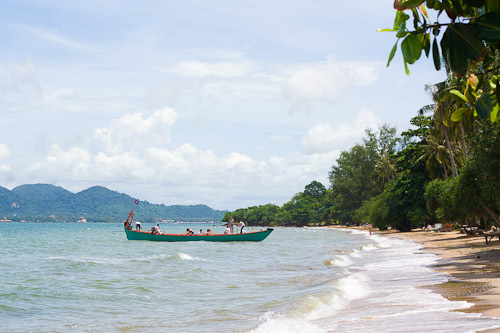 Rabbit Island is just off the town of Kep in South-east Cambodia. At a rough guess I would say it was called Rabbit Island because it resembles a rabbit. doh! 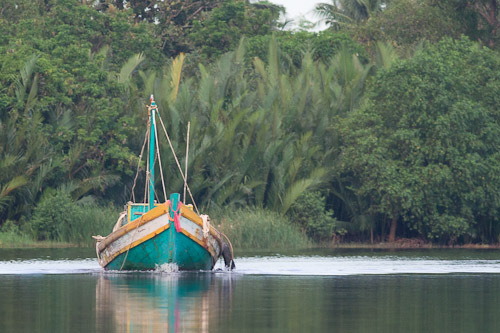 I got the boat out about nine o’clock after the usual run-around with tuk-tuks and travel agents, etc. Here are the boats that go out to the island. 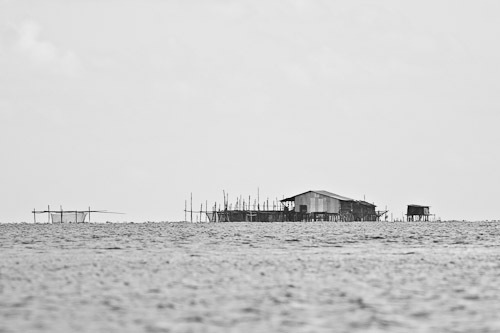 Kep was flattened by the Khmer Rouge who hated anything to do with the bourgoisie. Now it is being decimated by horrendous architecture. 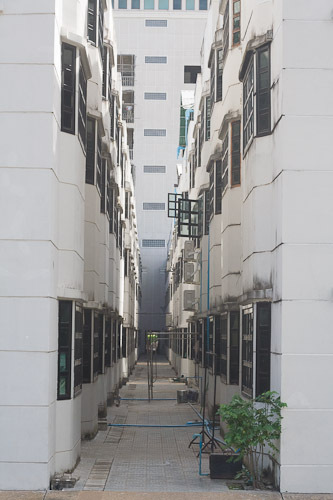 Modern Khmer architecture is very very ugly. Bad taste, kitch, the whole shebang. 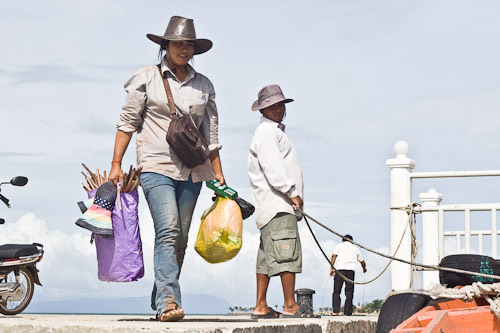 Here is one of the locals getting on the boat with a few supplies. This is the beach where I am staying. I went for a couple of swims this afternoon and it was very pleasant. I went for a walk this afternoon with the aim of photographing some birds. 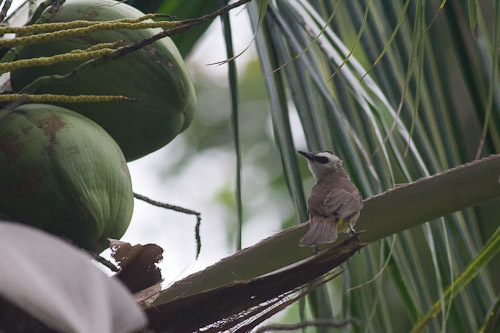 There were quite a few birds hovering around the coconut trees. But not much variety. 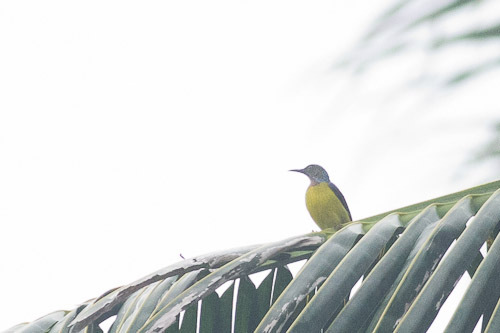 Quite a few Brown-throated Sunbird (Anthreptes malacensis) as well hovering around the tops of the coconut trees. It is hard to tell them apart from the Olive-backed Sunbirds but the bill is very different. 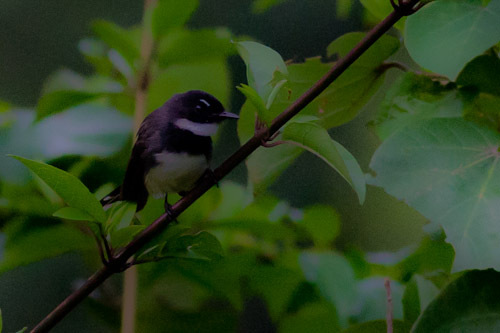 There were a few Pied Fantail flitting through the denser bush as I was walking around the island. They are a lot more skittish than our Aussie Grey Fantails who come up real close to you and check you out. 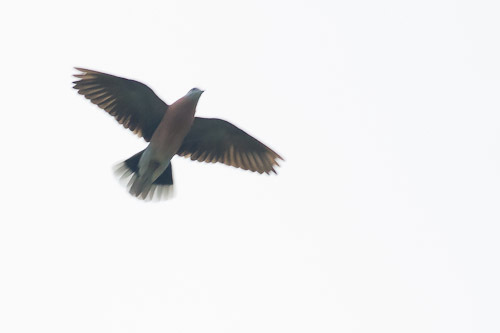 I did photograpgh something that resembled a Firrethroat but it is not likely as they are usually montane birds. 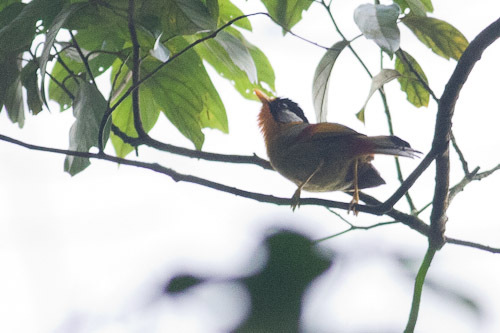 I then thought it might be a Rufous-breasted Bush-robin but no, they are usually in north myanmar. 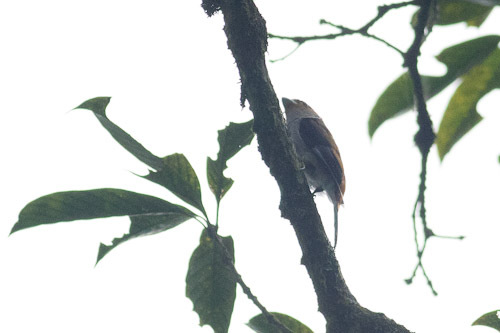 Maybe it was some type of blue flycatcher. I would show you the photo but it is total rubbish. There were a few seaweed farms on the other side of the island. 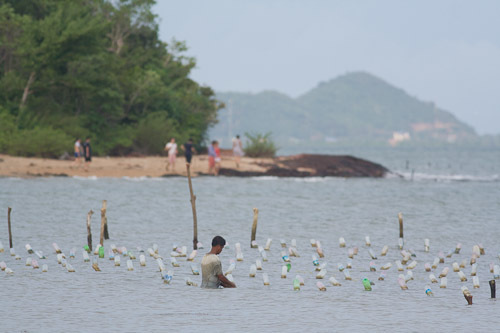 They had ropes strung along the beach with plastic bottles holding them up. Seaweed was growing on the ropes. I still had a bunch of photos left over from Kampot after I had gone to Kep. 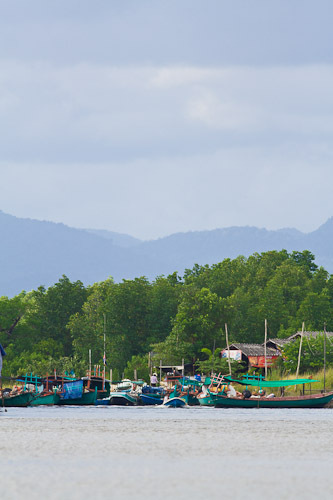 Kep is on the coast about 30 kilometers south-east of Kampot. 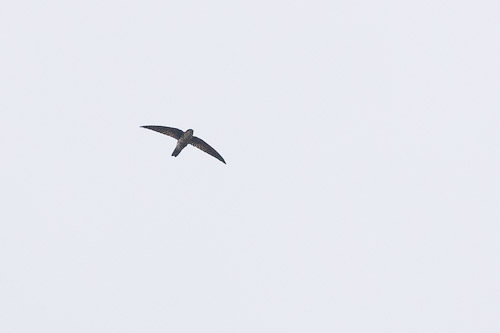 These swiftlets were flying over the guest house in the afternoon so I took this photo from my balcony. They have these houses where they play swiftlet calls to attract all the birds into the building to make nests. The birds make nests from saliva and Chinese people make soup from these nests. In the afternoon I went to the salt pans which are on an island in the delta of the river that Kampot is on. 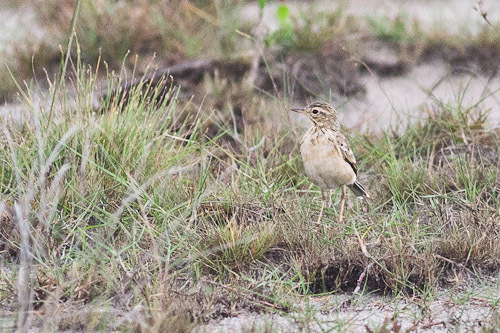 This Paddyfield Pipit has got quite a bit of rufous marking on his chest. There were a few Yellow-vented bulbul, Little Egret (Egretta garzetta)and Grey Heron (Ardea cinerea) as well but not much else. 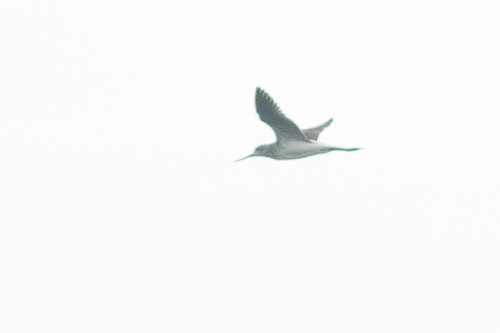 It might be an Asian Dowitcher but the underwings are not white. But the bill is straight. The Common Greenshank has a slightly upturned bill at the end. Not sure. Then this morning I was off to Kep and I went for a walk around the bush near my guest house. 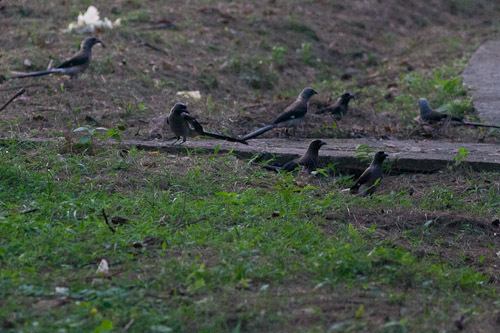 I saw a Sooty-headed Bulbul, a few Spotted Dove, and Common Myna. 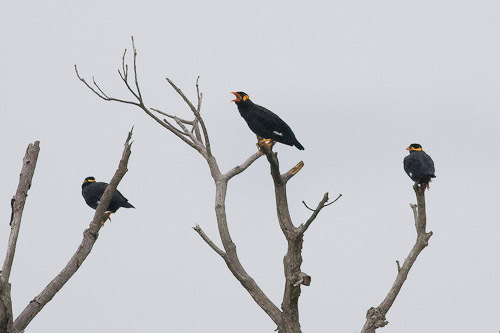 The neck colouring on these Common Hill-myna seems a bit orange to me. Maybe they are a local sub-species. It should be more yellow. 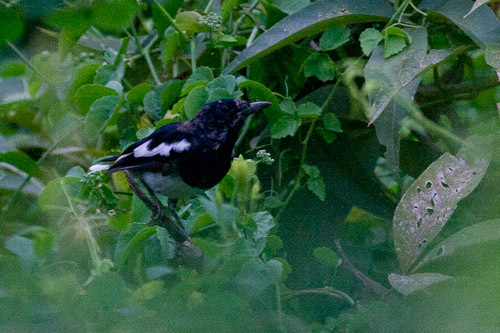 I also spotted a Black-collared Starling (Gracupica nigricollis). 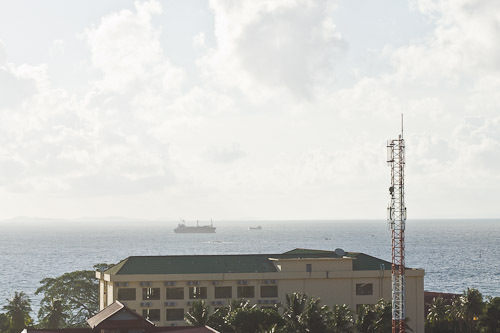 I hired a motor-bike this morning and went up to Bokor Hill. It is supposed to be a National Park, but they have put this ugly big casino right on top of the mountain. But the road is nicely paved all the way. I was quite excited to see this bird. 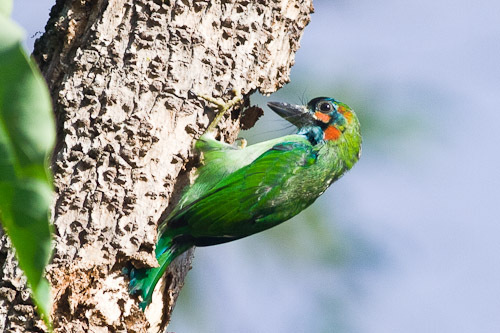 I love barbets and I want to see every kind. 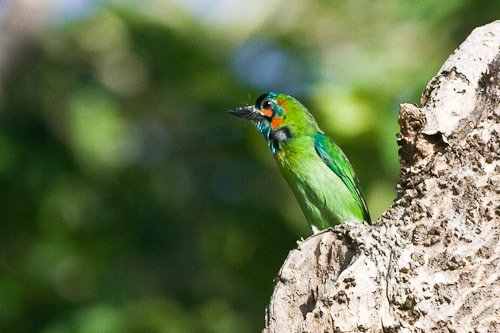 The Blue-eared Barbet (Megalaima australis) has a black patch at the front of the head, blue mid-crown, ear-coverts and throat with red patches above and below the ears and also an orange cheek patch. 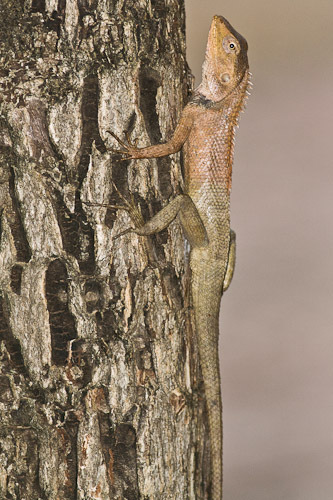 Their range extends from Nepal and India, South-west China and the Greater Sundas. So good I had to do it twice. The Blue-winged Leafbird (Chloropsis cochinchinensis) is all green with blue flight feather fringes and a blue patch on the shoulders. All these birds I saw on the way up the hill. On top of the hill, there was not much at all. 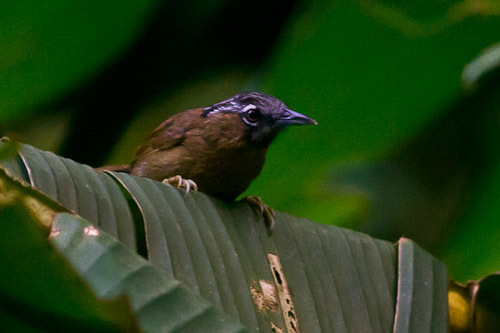 I also saw a Green-billed Malkoha (Rhopodytes tristis) near the giant buddha statue. 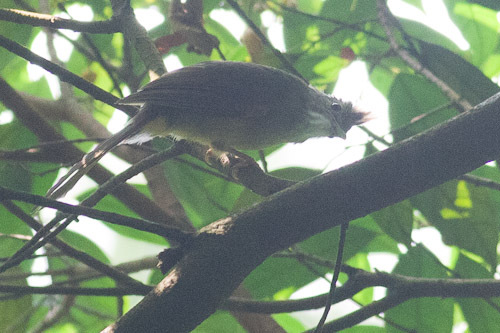 I have seen this bird previously in Thailand but the photo was not as definitive as this one. 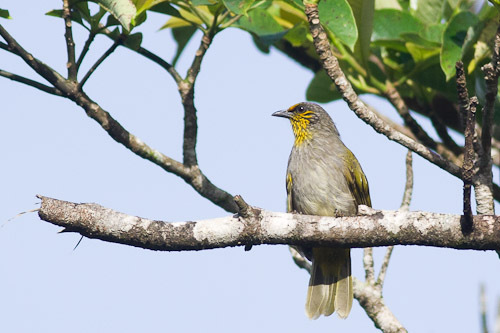 The Stripe-throated Bulbul (Pycnonotus finlaysoni) has yellow streaks on the top of the head, ears, throat and upper breast, as well as a yellow vent. 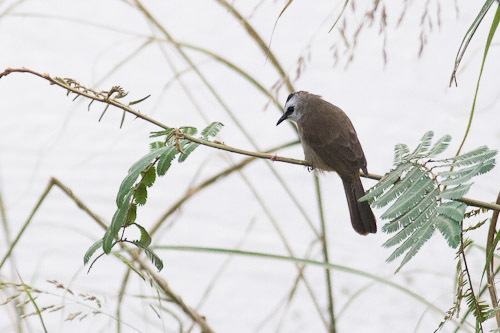 The Black-crested Bulbul (Pycnonotus flaviventris) is a very striking bird especially because of the piercing white eye. And the black crest sticking up, of course. Their front is all yellow. 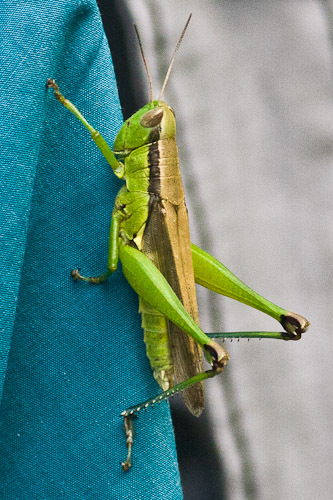 Race johnsoni has a red throat. 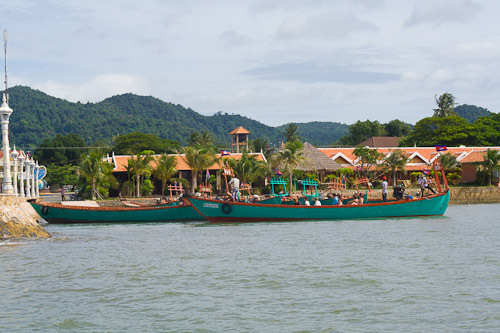 Kampot is about one hundred kilometers of Sihanoukville in Southern Cambodia. 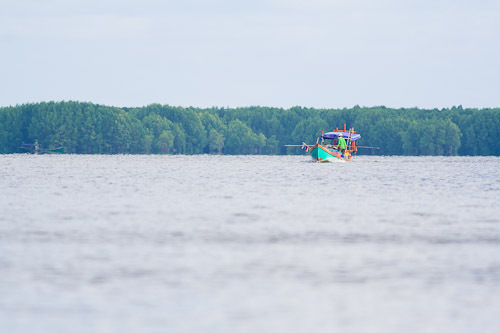 It is located on a river, the Kampong Bay River. This afternoon I took a tourist boat ride up the river, hoping to see some birds. Well I saw some but not a great many. 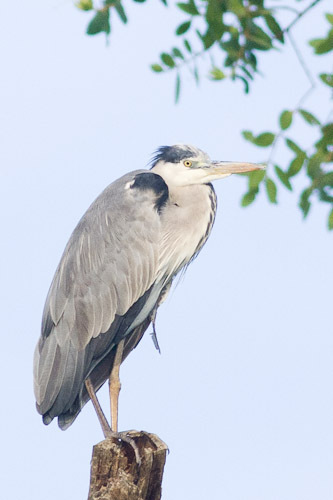 There were about four Grey Heron perched on trees along the river on the way up and they were still there on the way back. Most of them were juveniles, with grey sides of the neck, short nape-plumes and duller bills. 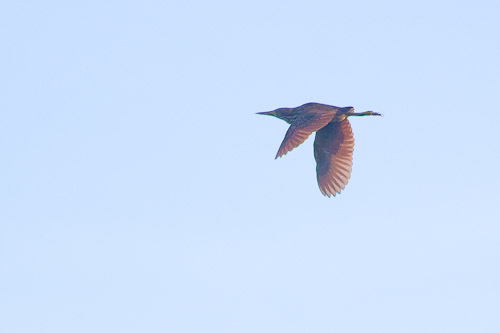 I just managed to photograph a Cinnamon Bittern as it flew across the river. In all, I saw two of them. There were lots of Asian House-Martin (Delichon dasypus) flying under the bridges just like in a lot of Cambodian river towns. 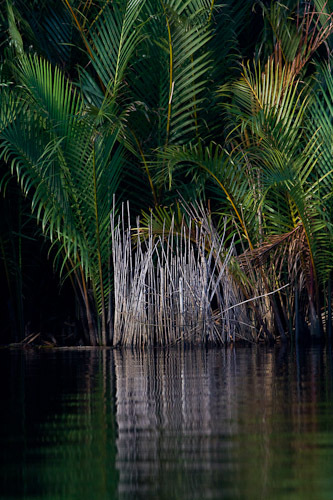 Ream National Park, Sihanoukville, Cambodia. I was supposed to go to Ream National Park yesterday but the trip was called off because of rain. Today it was just as rainy but it went ahead. 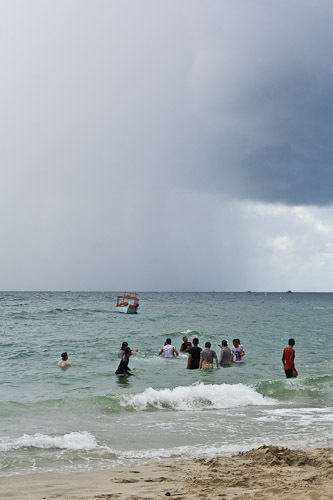 I just went with a tour from Sihanoukville. It only cost me $20, so it was a pretty good bargain. We went on a boat along the river to the mouth and walked around the headland to the ocean beach. 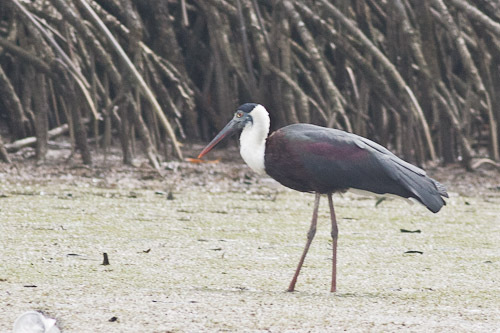 The Woolly-necked Stork (Ciconia episcopus) does actually have a thick woolly neck with glossy black plumage, white vent and tail-coverts and a dark bill. They live in a wide range from Asia to Africa. They are also known as the Bishop Stork or White-necked Stork. 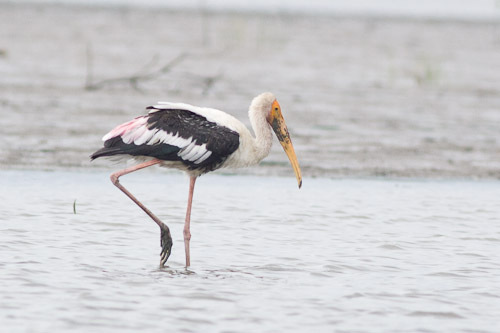 The Painted Stork (Mycteria leucophala) is white with black flight feathers, yellow head skin and pink tertials. Their range is Asia south of the Himalayas and South-east Asia. 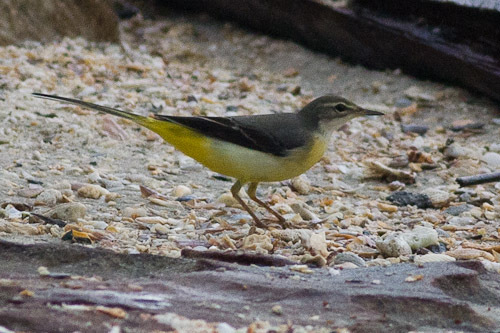 They have a heavy yellow bill with a down-curved tip. 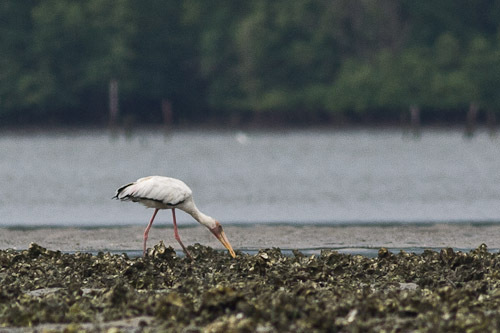 The Milky Stork (Mycteria cinerea) is all white with black flight feathers, yellow bill and red skin on the head. Their range is from Cambodia, Peninsular Malaysia and the Indonesian islands of Sumatra, Java, Bali, Sumbawa, Sulawesi and Buton. 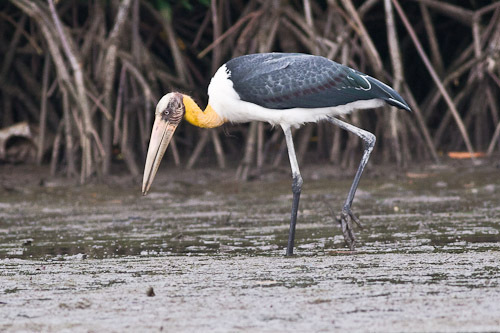 The Lesser Adjutant (Leptoptilos javanicus) is a large bird with naked pinkish head and yellow neck skin, white underparts and black wings. The upper edge of the bill is straight. 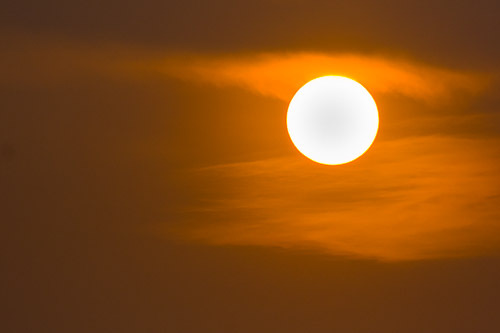 It is found in India, Nepal, Sri Lanka, Bangladesh, Myanmar, Thailand, Vietnam, Malaysia, Laos, Singapore, Indonesia and Cambodia. 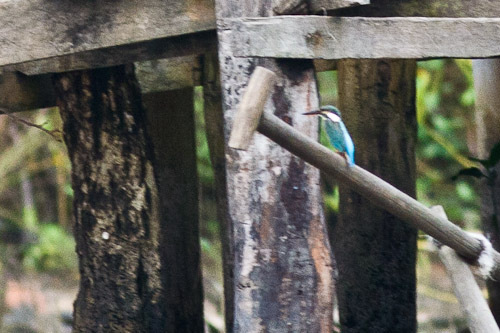 The Common Kingfisher (Alcedo atthis) is a small kingfisher found in Eurasia and North Africa. 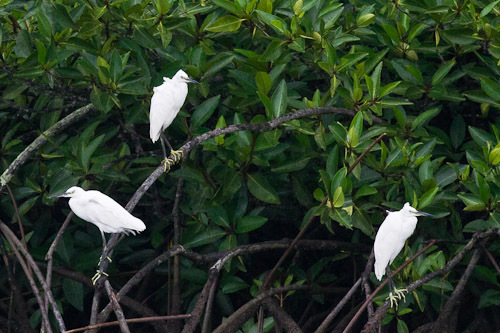 There were a few Little Egrets far off on the mud flats and about four of them roosting in the branches of the mangrove trees while the storks foraged below. 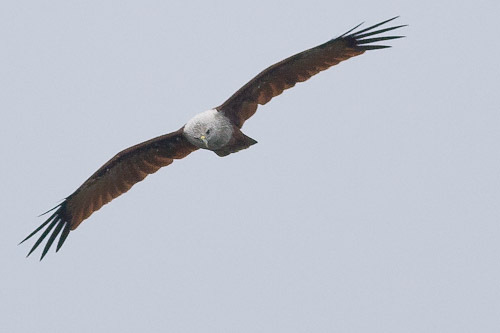 There were heaps of Brahminy Kites soaring all over the river and estuary. I saw a couple of juveniles as well. Some were roosting in the trees along the river. I actually did not expect to photograph any birds this afternoon. I just went down to the end of Hawaii beach and walked along the beach and up into the bush where they were building the new bridge to an island, Koh Pos. 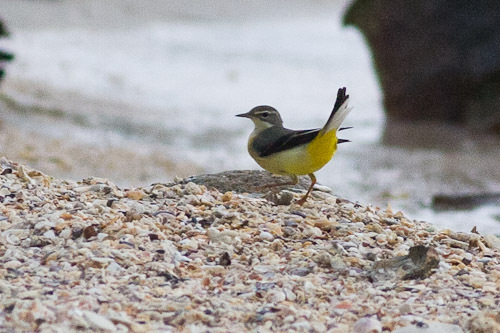 I could not believe my eyes when I saw this pair of Grey Wagtail (Motacilla cinerea) on the beach after I had wandered up the hill and found nothing except a Yellow-vented Bulbul and a Greater Coucal (Centropus sinensis). I just followed them up and down the beach, and each time I got too close they would fly off. 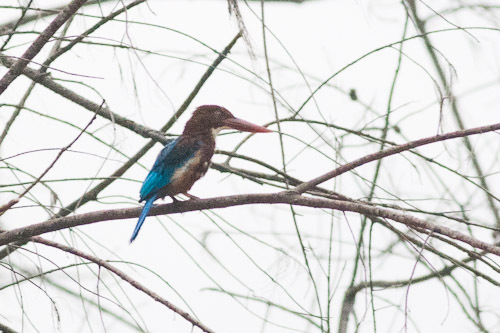 On the way back I stopped at the car park because I saw this White-throated Kingfisher (Halycon smyrnensis) perched over the road. 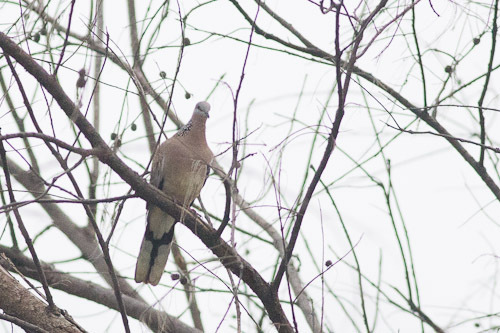 There were a pair of Spotted Dove (Geopelia chinensis) in the tree next to it. 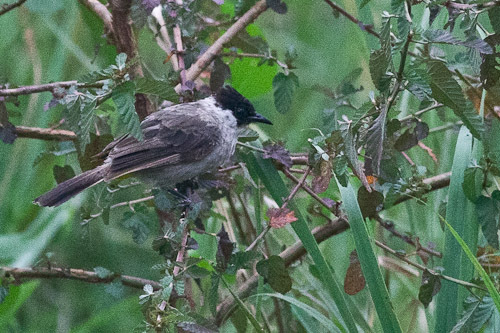 A few burning logs had a flock of Sooty-headed Bulbul (Pycnonotus aurigaster thais) feeding on something around vicinity. Still race thais. I have not seen any race klossi in Cambodia. Well I made it to the sea, finally. It has been a couple of months since I saw the ocean. I think the last time was at Prachuap Kiri Khan in Thailand. That seems like an eternity ago. 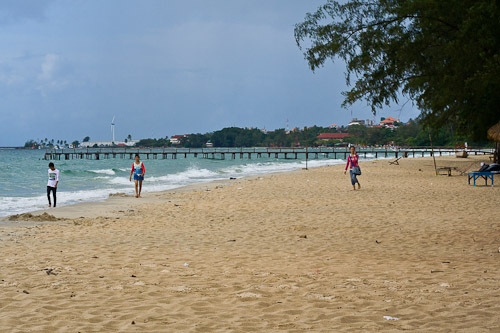 This afternoon after I got to Sihanoukville, I went for a walk along the beach and came upon this resort that had been left to rot or they had not finished it after years and years. There was all this black mould on the buildings. It was truly weird and creepy. It was called Treasure Island. ha ha. The beach was a bit nicer. They even had clean whitish sand. There were a few storms coming through and I had to take shelter under a bridge at one stage. There were a few people fishing under the bridge. Every five minutes you get asked if you want a moto or a tuk tuk. It gets a bit annoying after the five millionth time. This is the view from my guest house balcony. It is pretty good. The has just gone down and there is a pinkish glow over the horizon. Where was I last? I have lost track of where I was. I think it was Battambang. Since then, I caught a bus to the capital of Cambodia, Phnom Penh. I did not go into the Central Cardamon Mountains from Pursat because you need a bike to get in there. Phnom Penh was horrible, so I only spent a night there. The traffic there is insane and the city is just total madness. 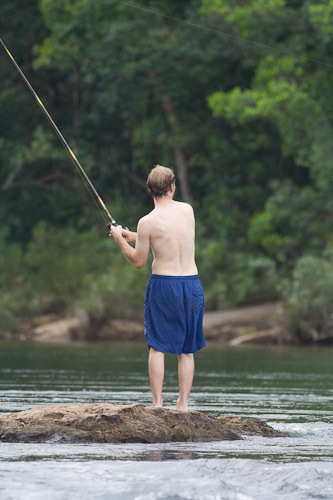 This is Andrew fishing for trout at Tahtai Waterfall which is about twenty kilometers from Koh Kong. We hired some motor-bikes for the day for six bucks each and headed off to the waterfall for a swim. The water was beautiful and cool and clean. 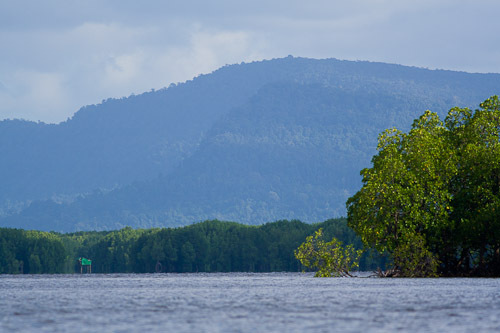 After that we went to Pream Krasaop National Park, which is a massive mangrove forest on the coast of Cambodia. I think I heard it was the largest in Asia. No birds but. I think someone saw a kingfisher, but I saw nothing whatsoever. I think that way might be Thailand. But then again, I think it might be the Cardamon Mountains. There was this fish farm stuck out in the middle of this bay. I think it is quite shallow there. We had crab for lunch at a restaurant in the mangroves. Freshly caught I reckon. Coming back into port from our boat ride around the bay. I did not get out of Battambang city while I was here. I just walked along the river, looking in the trees and the scrub along the river bank. But at least I got out and got a couple of photos. 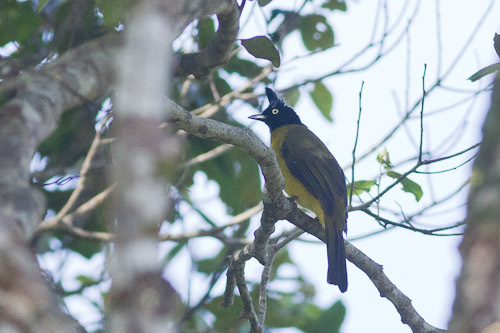 One surprising aspect was the sighting of three species of bulbuls – Sooty-headed Bulbul (Pycnonotus aurigaster thais), Yellow-vented Bulbul (Pycnonotus goiavier) and Streak-eared Bulbul (Pycnonotus blanfordi). The Asian House-martin (Delichon dasypus) were going under the bridge and scooping water just like they were doing in Kampong Thom.